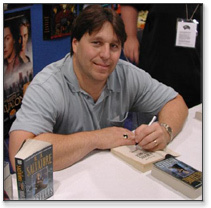 R.A. Salvatore is the most well known adult Fantasy Author in the world today and one of the bestselling authors from any genre. Bob Salvatore was born in Massachusetts in 1959. His love affair with fantasy, and with literature in general, began during his sophomore year of college when he was given a copy of J.R.R. Tolkien's The Lord of the Rings as a Christmas gift. He promptly changed his major from computerscience to journalism. He received a Bachelor of Science Degree in Communications from Fitchburg State College in 1981, then returned for the degree he always cherished, the Bachelor of Arts in English. He began writing seriously in 1982, penning the manuscript that would become Echoes of the Fourth Magic. His first published novel was The Crystal Shard from TSR in 1988. Since that time, Bob has published numerous novels, including the New York Times Bestselling The Halfling's Gem, Sojourn, and The Legacy, the first hardcover for Bob and for TSR. Bob held many jobs during those first years as a writer, finally settling in (much to our delight) to write full time in 1990. R.A. Salvatore is best known as the creator of the dark elf Drizzt, one of the fantasy genre's most beloved characters. Over eight million Drizzt novels alone have been sold with many translated into different languages and audio versions. His previously published TSR novels include The Icewind Dale Trilogy, The Dark Elf Trilogy, and The Cleric Quintet, as well as The Legacy, Starless Night, Siege of Darkness and Passage to Dawn. The Dark Elf Trilogy is now available in a hardcover collector's edition. The Silent Blade is his sixteenth original novel for TSR. In the fall of 1997, Bob's letters, manuscripts, and other professional papers were donated to the R.A. Salvatore Library at his alma mater, Fitchburg State College in Fitchburg, Massachusetts. When he isn't writing, Bob attends his three children's hockey games, horse shows, and fencing events. His gaming group of 18 years still meets on Sundays to play everything from Nintendo 64 Goldeneye to the AD&D game. Together they recently wrote The Accursed Tower, a Forgotten Realms game module set in Icewind Dale, due out from TSR in 1999. His hobbies include softball, hockey, and music, particularly a good blast of Mozart while tooling down the highway. He makes his home in Massachusetts, with his wife Diane, and their three children, Bryan, Geno, and Caitlin, their dog, Puddles, and a calico cat named Guenhwyvar.